In honour of Fathers’ Day in Australia here’s a third TV ad on the theme fathers and their children, from Telecom New Zealand ‘s “Keep In Touch” campaign. Saatchi & Saatchi Wellington made this ad for Telecom NZ in a bid to take the former telecommunications monopoly from commodity to a company with feeling and connection with human experience. The music behind the Saatchi & Saatchi Wellington campaign reveals the emotional power of the ad. When the creatives put their images together they knew that the ideal song was “Father and Son” by Cat Stevens, popular as a folk singer in the 1970s. Only problem was that Cat Stevens had converted to Islam in 1977, changed his name to Yusuf Islam, moving away from the popular music industry. Up to now he had resisted use of his music in the advertising industry. But after seeing the imagery and reading a passionate plea from the creative team, Yusuf faxed through his response, “Yes”. He later approved the use of his song “Where do the children play” for a follow up ad in the same campaign. Ivan and Stefan, on different sides of the Iron Curtain, are united by a love of play. 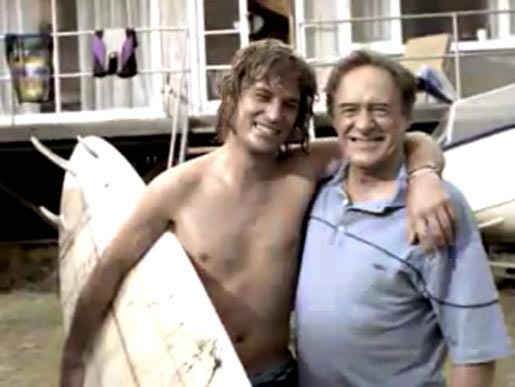 The Father and Son Life ad was developed at Saatchi & Saatchi NZ, Wellington, by creative director/copywriter Kim Thorp, art director Gavin Bradley, agency producer Juliet Dreaver, account supervisor Andrea Hammond working with Telecom marketing director Gail Teale. Filming was shot by director Gregor Nicholas via Flying Fish with producer Penelope Sinclair.